Bismark’s Construction Management services have been developed over many years based on our experience with a wide variety of projects. We are prepared to provide these services, as the Owner’s agent, in two phases: Pre-Construction and Construction. Immediately upon selection as your Construction Manager, Bismark Construction will undertake an in-depth review of all existing schematic designs and advise the Owner and Architect of potential high-cost areas, constructability issues, alternate materials and methods to maintain schedule deadlines, and potential problems relating to availability of labor and/or materials needed in the proposed design. In addition and concurrent with the design review, an itemized unit cost budget will be prepared for discussion, review and approval by the Architect and Owner. This itemized budget will be cross-checked with a parameter estimate prepared by Bismark based on recently constructed buildings of a similar type. As the development of design documents progresses, Bismark will commence with the creation of a detailed estimate. Our project baseline estimate will become a tool to create the team’s schedule that will build the project from Pre-Construction through Construction to Owner occupancy. As a construction firm, we are ready to offer our clients a full range of construction services. As builders, we are a true General Contractor first and foremost. Our staff has acquired their years of field experience from actually building, and not from merely watching. This important part of our knowledge is always brought to our clients, and even if it becomes unnoticed, it is still expected. We understand from hands-on experience how buildings go together. Our clients rely on us to build their buildings, but we are always building solutions for our future projects, and for tomorrow. The U.S. Green Building Council was established in 1993 to promote sustainability in the building and construction industry. In their mission to “transform the way buildings and communities are designed, built and operated, enabling an environmentally and socially responsible, healthy, and prosperous environment that improves the quality of life,” the USGBC has pioneered Leadership in Energy and Environmental Design (LEED) as part of its green building initiative. As a proud member of the USGBC, we wholeheartedly support the council’s goals. We share their vision that “buildings and communities will regenerate and sustain the health and vitality of all life within a generation.” Bismark Construction has built several properties according to LEED standards. We are currently working to meet LEED certification on our ongoing projects, and have applied reviews on other completed projects. Our experienced staff implements LEED and consultants as part of our Construction team. We bring that knowledge to every project, and like our peers in the USGBC, we strive to build better buildings. Our Design Build approach is clear: under this venue we are our client’s lead to take control and ownership of the project. Our experienced design team oversees the project from start to finish, and the client’s design costs are reduced thanks to the selected mechanical and electrical contractors providing insight with design. This process is intended to improve the effectiveness of the final construction documents. With our construction expertise we are able to interpret the design intent early to avoid constructability issues later on. Our design review is a starting point as a transition to our building process. 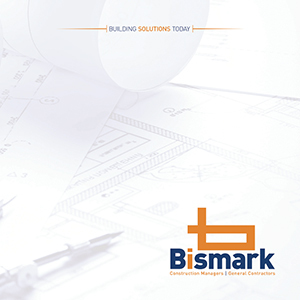 Bismark Construction offers state-of-the-art construction modeling software capabilities with all of our building methods. Our Prolog Converge software integrates with AutoCAD 3D/5D modeling software, establishing a project baseline by providing a detailed constructability review. The opportunity to expand the constructability with integrated information also optimizes all construction and coordination levels. We currently utilize the Building Information Modeling (BIM) system with our Design Build projects. This approach enables us to visualize the project in a 3D model to provide a constructability review of the building components prior to construction, limiting the loss of information between the Design and Construction teams and the Owner’s acceptance of the building. The BIM system reduces the project cost as we move through design into the construction phase, saving valuable funds and maintaining client schedules. Once final design, materials and schedules are agreed upon, we use the construction documents to prepare a final budget that, after agreement by the Owner and Architect, becomes the governing dollar parameters under which the project is constructed. Our staff will continue to monitor the final design, materials, suggested methods of construction, construction sequence and schedules to resolve any potential problem areas prior to commencement of construction.